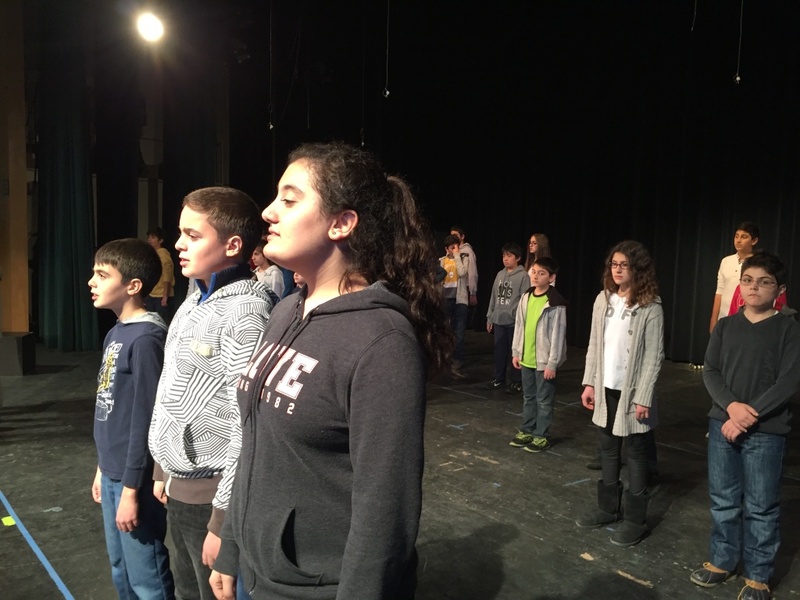 January 22, 05:00 AM :: Under the bright lights of the auditorium of John Muir Middle School, dozens of students are on stage rehearsing for a big poetry performance. Standing in a row with her classmates, Jwail Alnamh, a Syrian immigrant, recites her line: "I remember home when my country was all good and my grandma could take me everywhere." "I dream about seeing my friends once again and jumping rope and laughing," said Fima Kaoumi, who is also from Syria. These students are 48 of the students enrolled in English Language Development classes at the Burbank middle school. Like many recent immigrants, they're slowly mastering a language they didn't grow up speaking. To help them cope -- linguistically and emotionally -- teachers have designed a unit that uses poetry and performance to help English learners improve their language skills. For years now, teaching artist Kate Randolph has come the school to work with students on different theater techniques -- articulation, projection, body movement. Usually her class culminates with a performance of classic poetry, but this year she’s trying something different. "We’ve always based it on Langston Hughes poems about dreams, which is great," Randolph said. "But I thought, you know, you have such a tapestry of countries and ethnicities, why don’t we expand it?" So this year, the students wrote their own poems, all based around on the theme "homeland." Along with lines from published works, the students will perform their poems at a school assembly on Friday. About 7 percent of the roughly 1,400 students at Muir are not native English speakers. Teacher Jessica Wertlieb says the English learners are a really diverse group from a dozen countries, including Armenia, Syria, Russia and Mexico. She combines her class of intermediate and advanced English learners with the class of teacher James Koontz, who teaches beginners. Even though students are from all over the world, Wertlieb says they’re forging a little community. "It’s hard for them to fit in when they come to this school," she said, "and so I think this really gives them an opportunity to feel a sense of belonging." In his poem, seventh-grader Alexandr Ter-Zakaryan wrote that he dreams of one day being president of Armenia. Most of the English learners at the school are Armenian. Burbank has one of the largest Armenian communities in the U.S.
Alexandr arrived here five months ago and he’s still searching for that sense of belonging. "It’s very hard because some people don’t understand you. Sometimes when teachers say something it’s like, 'What?' " he said sighing heavily. He said the transition has been stressful, but the theater class is helping him practice his words and understand his classmates. Liane Brouillette is an education professor at the University of California, Irvine. 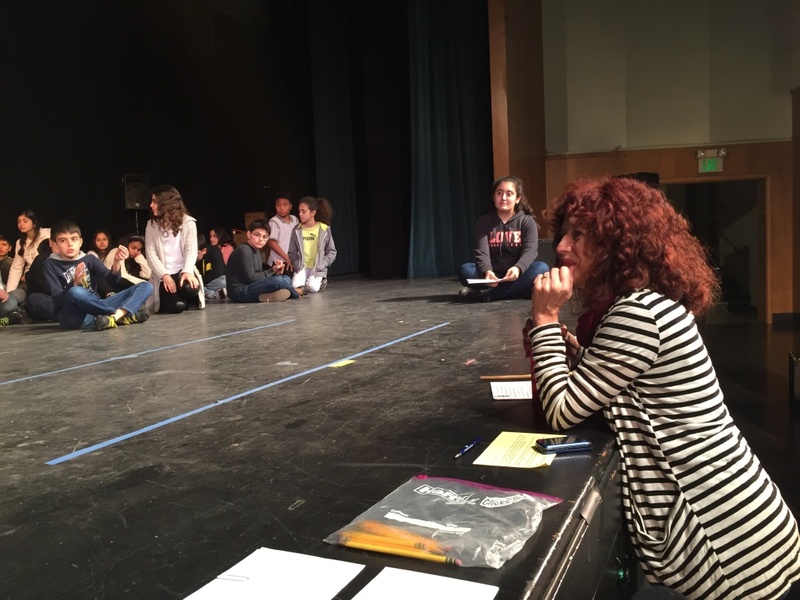 She studies the effects of performing arts programs on the skills of young English learners. She says oral language is always the first step. "If they’re not engaged in oral language and they’re silent in the classroom, they don’t have that foundation for literacy." Brouillette says incorporating drama also can put students in a mental and emotional space where it’s easier to learn. "Because the arts aren’t usually graded in the same way, they feel less self-conscious and that’s actually when you remember the best." She says this is especially true in middle school where students are maybe more self-conscious than ever. 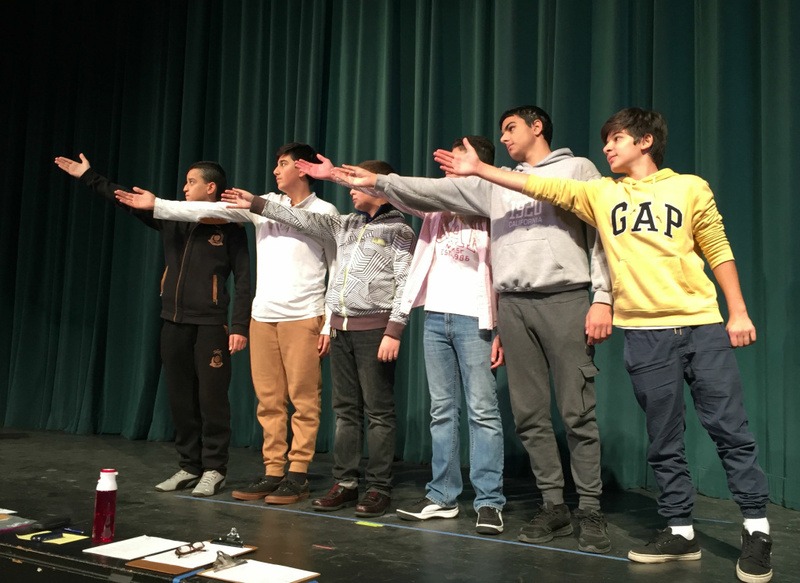 At Muir, Randolph does 10 sessions with the students, teaching them what it takes to be a performer -- how to stand, project, articulate. Teachers keep her coming back each year with grants from the education foundation Burbank Arts for All. During rehearsal she yelled out a mantra the children know very well. "Remember it’s your job to be heard, understood, and felt, OK?" She encouraged the students to show emotion in their performance and their writing. Eighth grader Meray Mahfoud took that advice to heart. "When I was writing I was, like, it was so sad," said Meray, who left Syria three years ago to escape the war. "I want to go back to my country but it’s really hard and difficult and everything’s messed up there and I miss my grandmom." She channeled those very real feelings into her poem. "I remember home," she recited during rehearsal, "when I see the cookies in the market that my grandmother used to make. I feel her and how she wants me to go back to Syria." This is Meray's third year working with Randolph. Her teachers say she's blossomed and gained confidence. She says making an emotional connection has really helped her learn English. "When you don’t understand the word and then they explain it to you and you do it emotionally, it helps you to understand the word," she said. The teachers say putting poetry into performance serves a dual purpose -- it helps with the practical stuff – vocabulary and presentation skills. And writing about personal experience has made students value the art of poetry. "I think it woke up in them, 'Oh that’s how poetry gets born,'" said Randolph. "It’s really real; it’s not just that corny stuff that we have to memorize and recite sometimes."